MAESTRO: World-renowned conductor Richard Davis makes his debut with Geelong Symphony Orchestra in its upcoming concert. Costa Hall will reverberate with the sounds of Geelong Symphony Orchestra playing concert favourites Brahms and Tchaikovsky next month. “A big highlight will be the magnificent Tchaikovsky Piano Concerto played by the 2018 Australian Youth Classical Music Competition winner, Rio Xiang,” said Jon Mamonski, the orchestra’s general manager. Xiang, a 19-year-old Sydney-based pianist, won the competition in Geelong last year and had played with some of the world’s most celebrated orchestras since, Mamonski said. 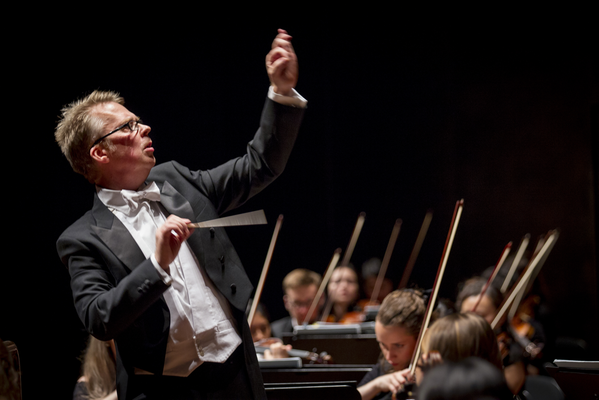 World-renowned conductor Richard Davis makes his debut with Geelong Symphony Orchestra in the concert. Davis regularly conducts orchestras such as Queensland Symphony Orchestra and BBC Philharmonic in concerts, recordings, radio broadcasts and on television. He has just returned from the UK after making his debut with the City of Birmingham Symphony Orchestra. Davis joined the Melbourne Conservatorium of Music in early 2017 as Associate Professor in Music and Head of Orchestral Studies. “He’s a brilliant conductor,” Mamonski said. The night’s program includes Brahms’ Academic Festival Overture, Tchaikovsky’s Piano Concerto No 1 and finishes with Brahms’ Symphony No 1. “Everyone knows Brahms’ lullaby and he’s produced one of the most varied range of melodies of all time,” Mamonski said. The concert takes place at 7.30pm in Deakin University’s Costa Hall, on Saturday 2 March. Tickets are now available at gpac.org.au.